Winning the Milky Way at an eBay auction (3ACV15). The being of inconceivable horror is an alien who owns the Milky Way, having purchased it online through an eBay auction (for an unknown price). 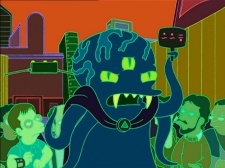 He - or his online avatar, at least - has three eyes and four tentacle-like arms. He is of an unspecified species. Auctioneer: Are there no further bids for this exquisite galaxy? [He bangs his gavel.] Sold, to the being of inconceivable horror. Being of inconceivable horror: Will a money order be OK? This page was last edited on 27 August 2013, at 05:48.